Whenever you're feeling down and lonely, please try to remember there are other people out there a lot worse off than you are. For instance, any of the characters seen in the following 75 minute movie made 1947. 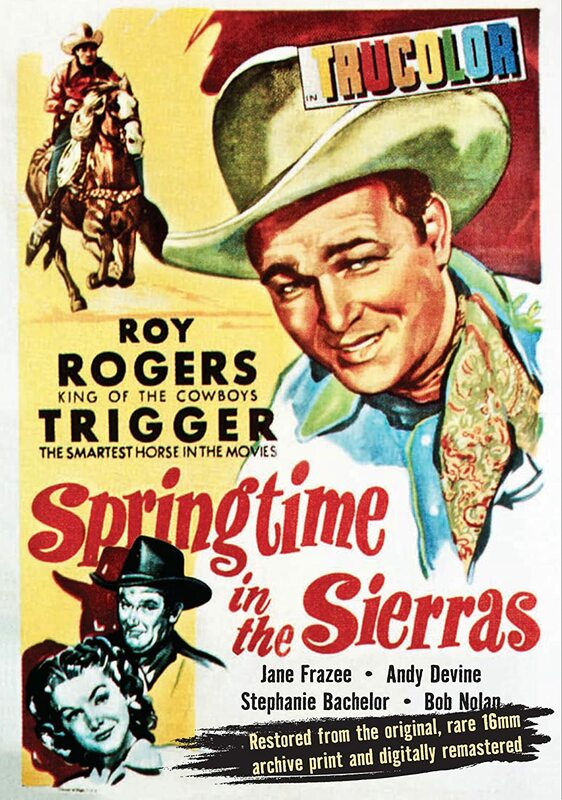 It was Directed by: William Witney; and Starred: Roy Rogers, Trigger, Jane Frazee, Andy Devine, with Stephanie Bachelor. Please take a seat, Taffy (Jane Frazee), because I'm afraid to say I've got some very bad news for you. Some very bad news. Now I'm sure you can remember explaining to me how you've become concerned for your brother ever since he started hanging round with Jean and Matt (Stephanie Bachelor and Roy Barcroft)? Well, just the other day I ran into a poacher over by range. And even though he somehow managed to get away from me, as luck would have it, by mistake he accidentally left behind his horse. And to be honest with you, Taffy, I believe the horse in question belongs to your brother, Bert (Harold Landon). Worst still, when we suddenly heard about Cap (Harry Cheshire) getting murdered, I quickly noticed how Bert began to act strangely around people. Going so far as to slap me in the face when I asked him if he knew anything about this! Then again, that's most probably why what next transpires all goes into stealth mode when Jean says to me, 'Hi, Roy Rogers (Roy Rogers). Do you want to go out on a date?'. As a plan is hatched inside a Trojan horse - a lot of singing is sung of course - the good guys get locked-up in a block of ice - and at the end of the day, what happens to the bad guys isn't very-very nice. Now the only aspect about 'Springtime in the Sierras' I didn't enjoy was how it started off like some sort of public service announcement. Well, in no uncertain terms the first fifteen minutes was dedicated in telling the public how killing animals out of season was a bad thing to do. Plus to make matters even more boring, for some strange reasons the filmmakers then decided to lavish this message with some pretty bog-standard visuals, complemented with a story-line that wasn't even there. Honestly, my friends. Apart from introducing most of the characters, on the whole, the main thing this sequence accomplished was to inform us -- the general public -- that killing protected wildlife was against truth, justice, and all of that type of cr*p. Furthermore, there was a very 'class-room' vibe about this section as well. In my opinion it came across as if it were meant to be used in schools as a teaching aide to inform pupils about what's wrong and right. Thankfully, though, once this particular section was over and done with, the rest of this movie was one hell of a pleasant viewing experience. As per usual every single one of the actors stood their ground and did what they did best. Roy did his singing Superman bit. Andy was his comedic aide. Jane was as peachy keen as a woman overdosing on peaches in peach season. Harold did a pretty good job at playing the wayward brother. And as for Stephanie and Barcroft, boy-oh-boy, what an evil bunch of rat-bags they were! Granted, it did help that most of this film was sprinkled with a nice dose of melodic melodies and a simple story-line. Not once did I wonder what was happening to whom and for why. If anything, I actually enjoyed those musical interludes and comedic sequences, even thought they did break up the general narrative on occasion. Not too much of course. But just enough for me to have some 'down time' between one story beat and the next. As for the actual tale on the other hand, well, that wasn't too bad to follow I suppose. Essentially it was about a lad falling into the wrong crowd and eventually coming out of on top with some help from his true friends. Plus I best mention that the characters themselves were pretty well defined and did aide this plot one way or another. Funnily enough, I can say exactly the same thing about the following filmic-facts! 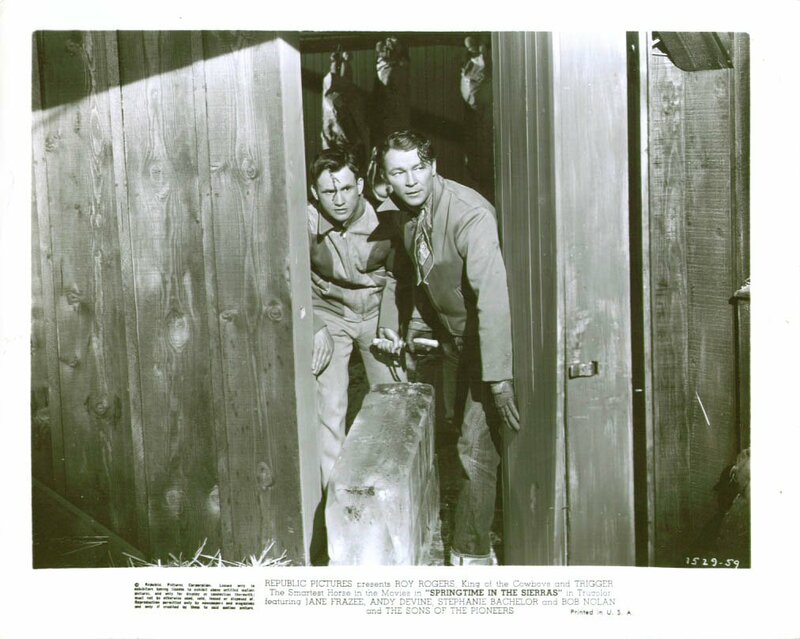 (1) 'Republic Pictures' first released this production in America on the exact same day George Waggner released his Randolph Scott film, 'Gunfighters'. It was on the 15th of July, 1947. (2) Loosely translated, this project was entitled 'Spring Blossoms in the West' in Finland, 'Spring in the Sierra' in Brazil, and during post-production it was given the alternate title, 'Song of the Sierra'. (3) The majority of this movie was shot at 'Walker Ranch', Placerita Canyon Road, Newhall, as well as throughout the Californian state of Santa Clarita. (4) One of the taglines used to promote this picture, was, 'Tough in a scrap. Tops with a song. More thrilling than ever!'. (5) There are two versions of this adventure now available to the public. There is the original version, which is 75 minutes long, plus an edited down version, which is 54 minutes long. 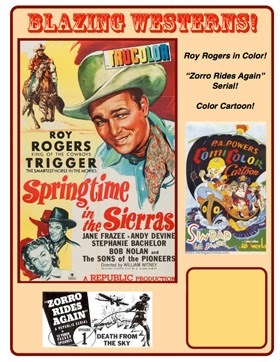 (6) The screenplay for this flick was written by Sloan Nibley, and throughout his fifty-seven year career he has written for such television shows as 'The Adams Family', 'The Famous Adventures of Mr. Magoo', and 'Wagon Train'. (7) The actress Jane Frazee was in a vaudevillian double-act with her sister Ruth since she was six years old. They broke up years later when Ruth failed her screen test at a major Hollywood studio. 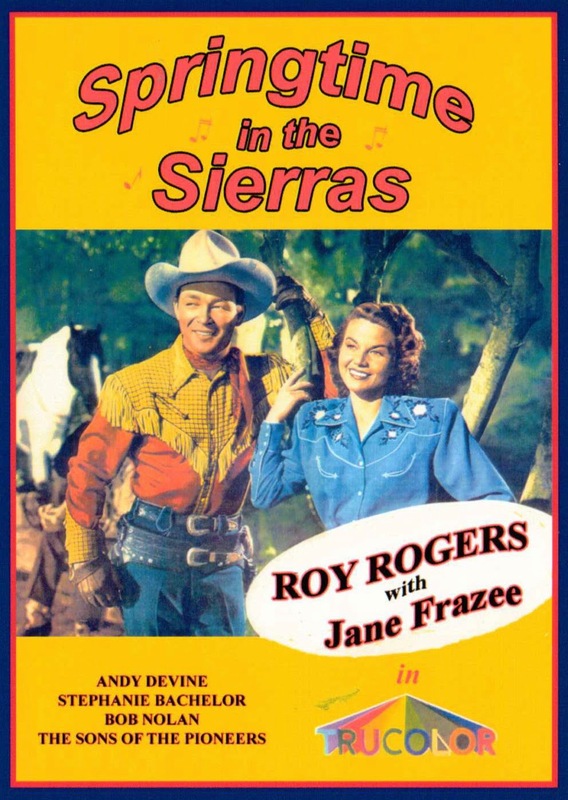 (8) After this western whipped up a storm, Roy Rogers and Jane Frazee starred in their next film together, 'On the Old Spanish Trail'; whilst Harold Landon starred in the crime-drama, 'The Black Widow'. Overall I'd say 'Springtime in the Sierras' is a fairly decent film. Even though it kicked off on a bum note, the rest of it was full of adventure, songs, and a message that is always relevant in any given age. Protect your wildlife and be good to your fellow man. Nuff said.